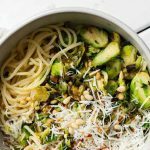 This pasta with shaved Brussels and leeks is my new fave! It’s filled with good-for-you ingredients and tons of flavor. Perfect for the new year! Cook the noodles according to package directions. Drain, then place in a large bowl and stir in the butter until it melts and evenly coats the noodles. While the noodles cook, slice the white and light green parts of the leek into 1/4″ slices. Heat the olive oil in a large skillet, then add the sliced leeks and cook until starting to brown in spots. Add the shaved Brussels sprouts and a pinch of salt and continue cooking, stirring often, until the they are bright green and a bit soft, about 8 minutes. They should still be a bit crunchy. Add more salt if necessary. While the Brussels cook, place the pine nuts in a small, dry skillet and place over medium heat. Cook, tossing very often, until lightly browned in spots and fragrant. This should only take a minute or two. Remove to a plate to cool. Finally, toss everything together with the noodles and serve. – I bought two 10 oz bags of the pre-shaved brussels and used 1 1/2 of them. Way easier than shaving your own! -If this is all you have for dinner, it’ll likely only feed 4.